Some time last month Auntie Florence and Mamarazzi decided to be good citizen and submit their Tax via e-filing. It was a breeze. Very fast and easy. Maybe it was still early and not many people logging yet. Well, after the "taxing" session, we all went to have lunch at Pizza Hut nearby. Funny...lunch time also not many people. Only 2 or 3 tables occupied. Very hungry leh after the "taxing session". Planned to eat a lot. Hence we sat at table for 6 persons although there were only 4 of us. Haiz...the staffs there kept insisting that we sit at table for four. Aiyo..the place so empty lah. Cannot sit at table for 6 meh? More roomy mah. Eat also will be more comfortable and can order more. If the place was full then we understand lah. Mamarazzi ordered the Set Meal which comes with two Pizza, four mushroom soups, breadsticks and a jar of pepsi. See! so many things. If put in table for 4 would be very cramped leh. This one have not include my Kiddy Meal yet leh. Kids eats for free if purchase above certain amount. I opted for "noodles". Presentation nice but I did not finish the noodle coz it was "sticky". Mamarazzi said maybe overcooked. Papa said could be they forgotten to add some oil in it. Very healthy kids meal coz it comes with a cup of Soya Bean. Moreover, it comes in a plastic cup which is kids friendly. 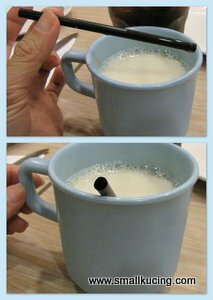 Hmm...would appreciate it if the straw was a bit longer. Kinda hard to drink with a short straw. But then I was kinda naught. I preferred soft drink. Overall, the set meal at Pizza Hut was quite worth it. I have not been to Pizza Hut for years and years. Wah, your mama doesn't submit online kah... Why, people there all send personally to the office themselves one - I thought all so canggih, so tech-savvy one. I'm fine - no money, no need to pay tax. Hehehehehehe!!!! So government is made richer by two abiding citizens.. hahaa..
i've been using eFiling since its launch in 2006, i'd say it's a good one!! easy, convenient, simple and speedy!! you see, after click on submit, i already got my tax refunded into my account within 2 weeks leh..
hmmm, which PH outlet was that?? lunch time also no people, sure know something not right lah.. haha!! go PH only their pizza can make it lah.. the pasta can forget it.. even the once very nice soup and garlic bread have already drop standard a lot..
Not much people at the outlet, I guess they need to sing this song again, "Balik makan, balik makan, oh oh oh! Balik Makan...."
I like the new promo in pizza - kids eat free everyday. I've been going to Pizza Hut lately too. They've some promos which is good deal. U know how teenagers are these days.... they like all the fast food. Lol! Wah, kids get to eat for free? I didn't know PH has that.. Must visit PH one of these days! Me too, have not been there for ages. Joshua, you always opt for noodles don't you? Lol! Mamarazzi submitted online a few year lo.